Everyone knows how much the British enjoy talking about the weather and since I moved to Bogotá these are some of the weather-related comments/questions I’ve had from people back in the UK, along with some answers! There is no single answer to this question. Firstly, Colombia’s topography and mountainous nature means that the weather will depend on where you are. Secondly, Colombia is on the equator, which means that it doesn’t have seasons like Europe or the US. The temperature remains more or less the same all year round, fluctuating only by a few degrees. What varies is the precipitation – in Colombia, there are wet seasons and dry seasons. At an altitude of 2600m, over the course of a year, the temperature typically varies from 7°C to 19°C (it could be both temperatures in the same day!). The average temperature is 14.5°C, and is rarely below 2°C or above 22°C. Situated at 1500m above sea level and known as ‘the city of eternal spring’, the average annual temperature in Medellín is 22°C (72 °F). Temperatures range from 15 to 30 °C. At 1000m, Cali will feel much hotter than Bogotá and Medellín. The average daily temperature is typically 24°C with average highs of 32°C. Over the course of a year, the temperature in this Caribbean coastal city typically varies between 24°C and 31°C and is rarely below 23°C or above 33°C. The short answer is no. Bogotá has what is known as a subtropical highland climate; it’s located close to the equator (i.e. the tropics) but is at high altitude (2600m). Therefore typical weather in Bogotá would be warm/cool sunny mornings, cloudy/rainy afternoons and chilly evenings. You will tend to fluctuate between feeling comfortable and chilly, and will usually need to wear or carry a sweater. That said, because of the altitude, the sun is very strong when it is out and it is common to see people walking around with umbrellas shading themselves. 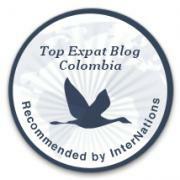 Don’t be caught off-guard – fair-skinned people will burn really quickly in the Bogotá sun (believe me!). Bogotá: ‘cloudy with sunny spells’! Well, I haven’t missed the British winters, that’s for sure! Although it can get quite chilly at night in Bogotá, it is never freezing. In fact, most people do not have central heating in their homes, because it generally isn’t needed. 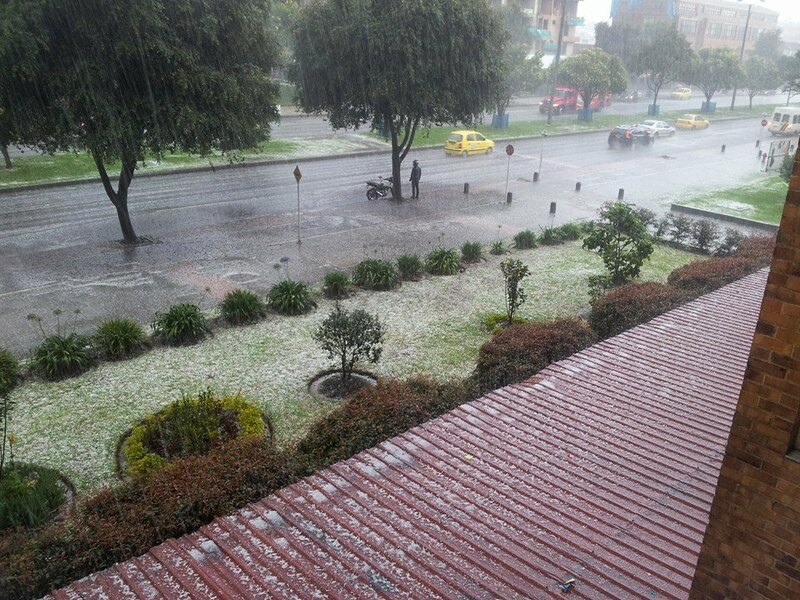 But in many ways, Bogotá weather isn’t very different from London weather most of the year round. It’s often cloudy with sunny spells and it rains quite a lot. The weather is just more extreme – the clouds appear huge because Bogotá is 2.5km closer to them than London; usually when it rains in Bogotá, it rains (see photo evidence), and it’ll rain every afternoon for a month or more during the wet season; however, Bogotá sees a lot more of the sun than London does. Even on the days when the weather isn’t great, you usually still have a few hours of sunshine in the morning. That said, in London we get heatwaves; in Bogotá, heatwaves don’t exist because of the altitude. You can’t feel the passage of time via the weather in Bogotá either, as you can in London through the seasons. I do sort of miss that. Whoa hang on! It’s not all bad! 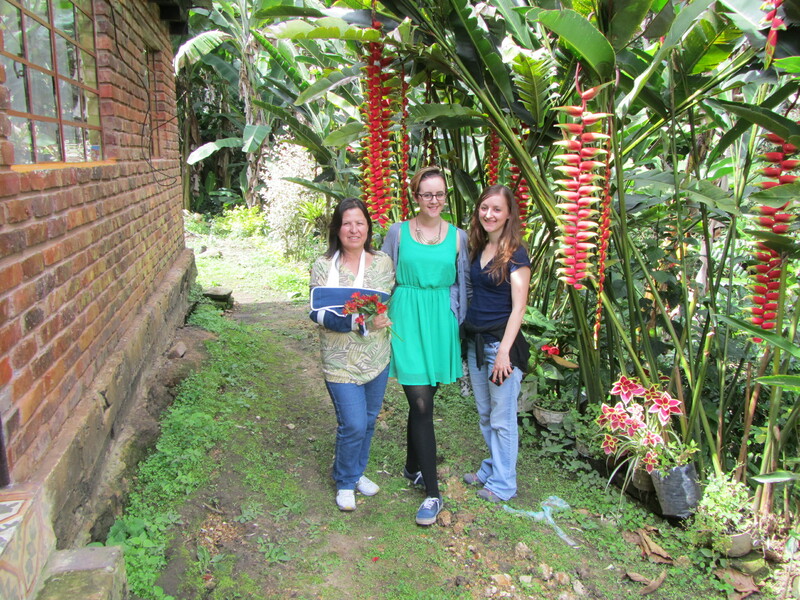 The great thing about Bogotá is that it is only a few hours away by car (traffic-permitting!!) to a warmer climate. As the city sits on a high plateau in the Andes close to the equator, you only have to descend (driving outside of the city) to enjoy some hot weather. The city of Girardot, for example, is just 3 hours drive from the city, and at 300m elevation you’ll enjoy an average temperature of 28°C. Or drive 2 hours to the coffee farms of Tibacuy and enjoy warm weather of around 24°C. And in the country of endless long weekends, you’ll have plenty of opportunities to get out of the city for some warm weather!